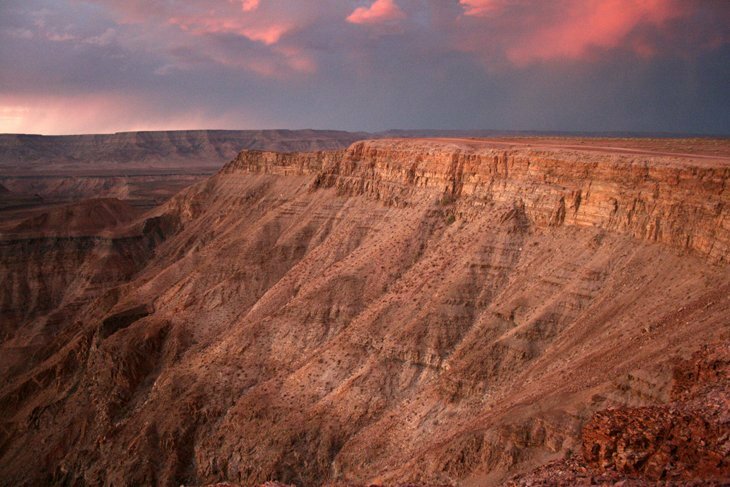 Namibia is one of the world’s least populated countries, full of wild and wide-open spaces that make it an adventurous and exciting place in which to travel. 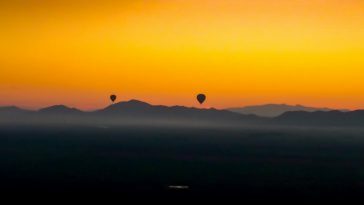 And it’s a great place for landscape photography, too, with deserts and dunes, bush, salt pans and rocky peaks to picture beneath the big African sky. 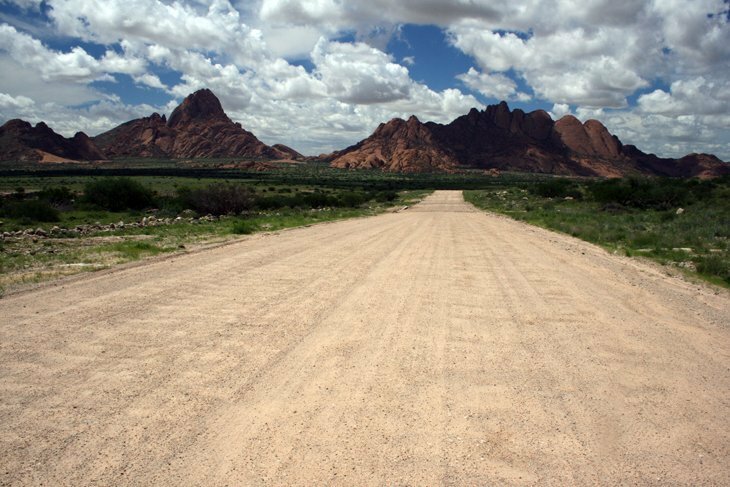 The rim of the Fish River Canyon and the boulder-like hills of Spitzkoppe – ‘the Matterhorn of Namibia – were two highlights during my trip, both located on the edge of the 2,000 kilometre-long Namib Desert from which the country takes its name. 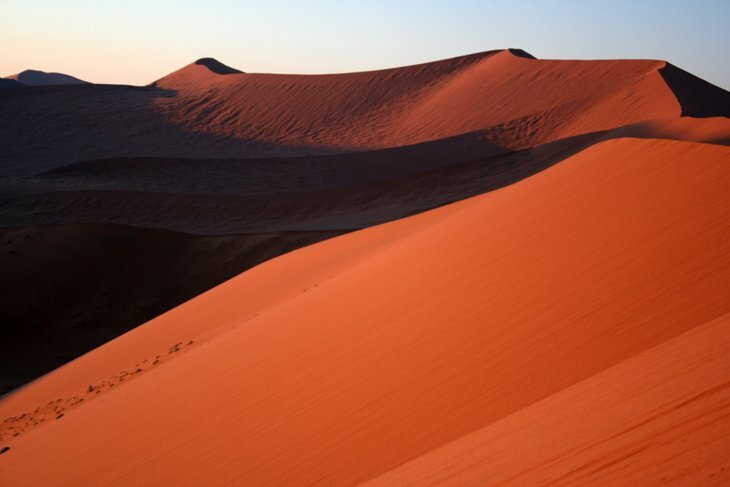 The Namib’s shifting sands, mountains and gravel plains extend the entire length of the country. 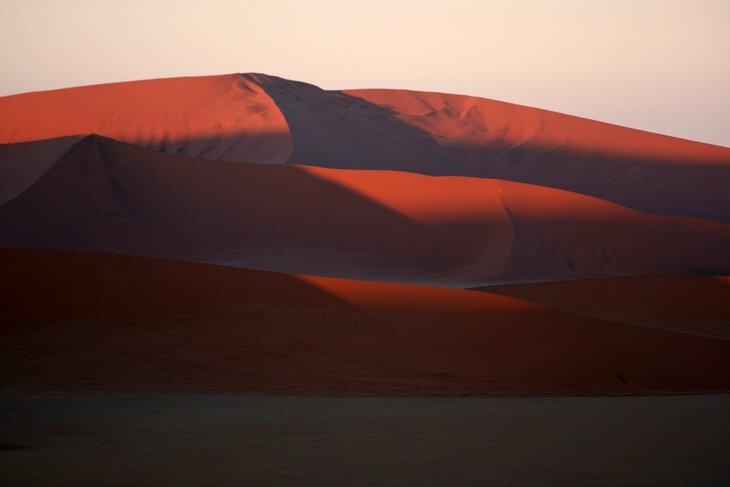 The sand dunes in the Sossusvlei area of the Namibia were another standout. This iconic undulating landscape was one that I’d seen in travel magazines and photographs, but was even more impressive up close. 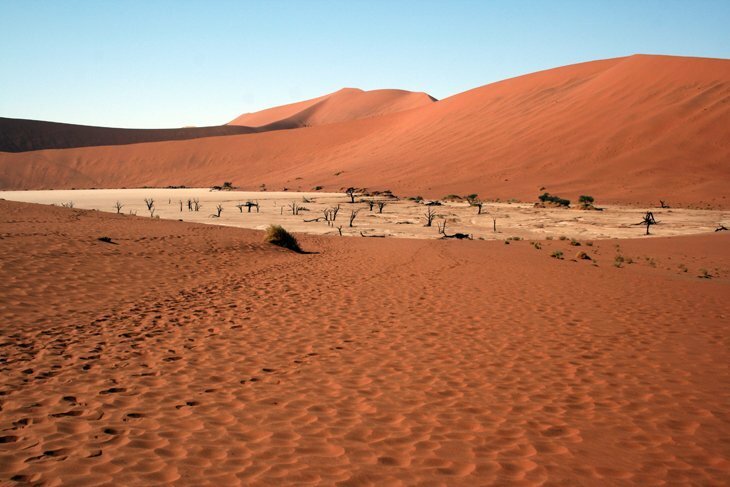 Sossusvlei comprises a huge pan, or vlei, surrounded by towering dunes that are thought to be the highest in the world. They’re staggeringly beautiful at whatever time of the day you see them, but at their most dramatic at dawn and dusk when they change colour in the low light – first plum, then ruby red, a soft pink and then vibrant orange. 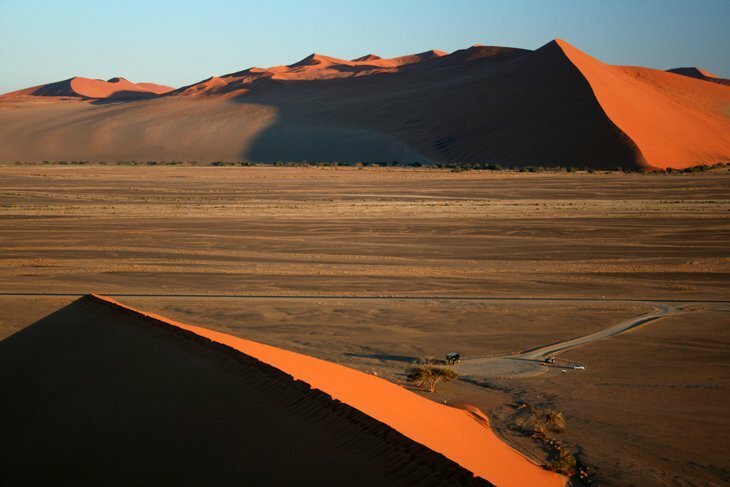 I hiked up one of them, simply named Dune 45, at dawn. It was smaller than some nearby, but the 170-metres pyramid of sand still took 45 minutes to scale. The going was harder than I expected, taking a few steps up and at least one back as the sand flowed beneath my bare feet, the fine grains slipping between my toes. 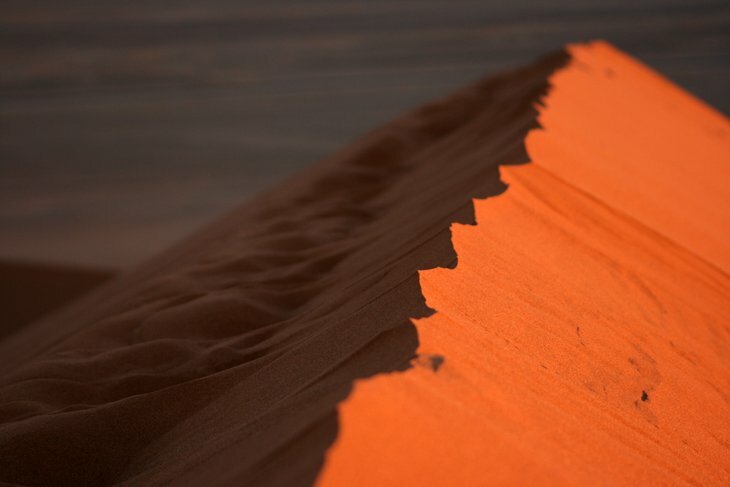 “Walk on the ridge between the two sides of the dune,” my tour leader suggested and I then got the hang of it, walking step by methodical step along the prism’s edge as the light increased and the sand on the dune’s sun-facing side began to glow. I’d never imagined a sand dune could be quite so tall. 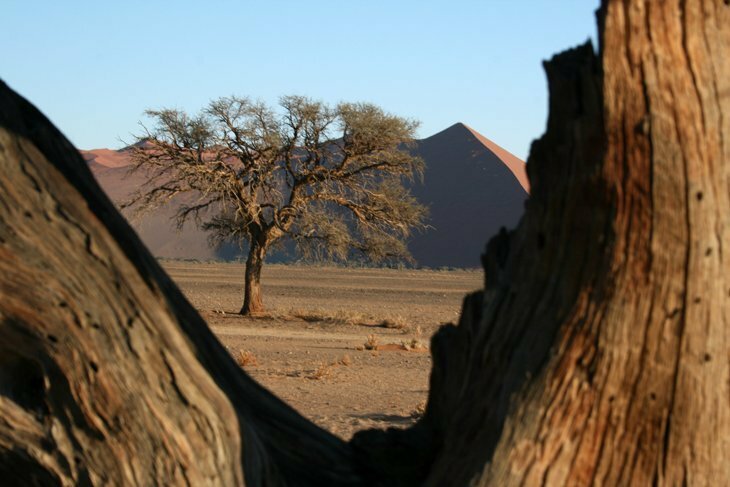 But another in the Sossusvlei area, Dune 7 – or Big Daddy as it is also known – is twice as tall, at 325 metres. I was out of breath when I reached the top, but as happy as could be as I sat on the edge of the dune facing the rising sun, savouring the warmth on my face and the solitude of this remote place. 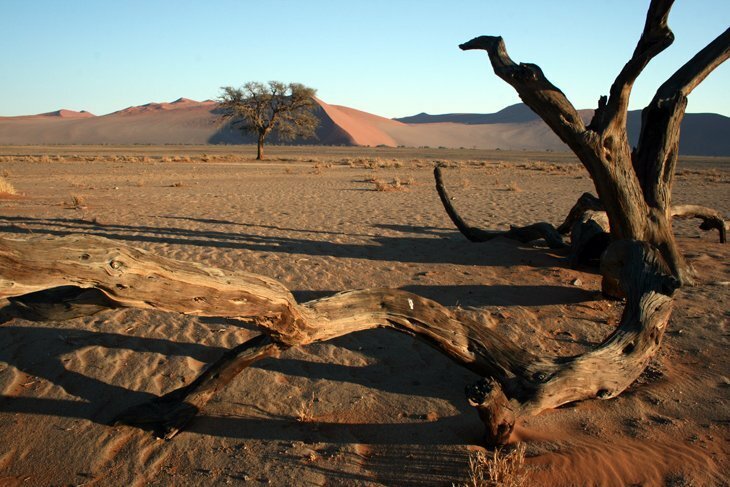 The Namib is an unforgiving place, but the indigenous San people have learned to live in the desert. So too have animals such as ostriches, springboks, mountain zebras and oryx. Rhinos, elephants and giraffes are among the other species that you can see in the superb Etosha National Park in the north of Namibia. 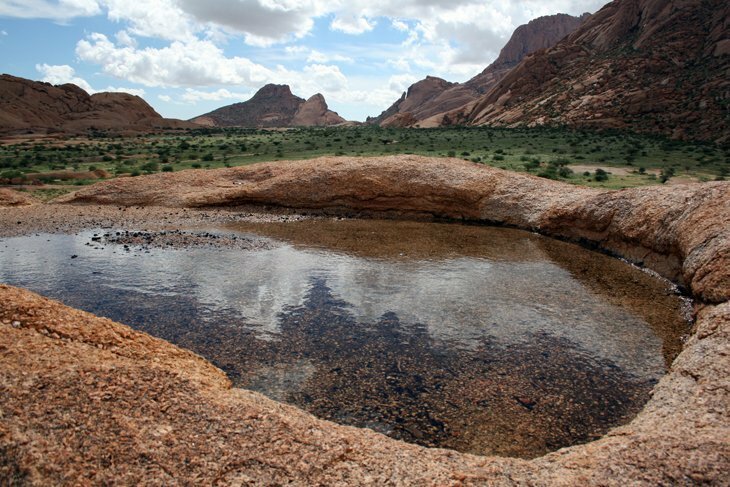 It’s another arid area, much of it comprised by an enormous salt pan that fills with water at certain times of the year, sustaining the animals. 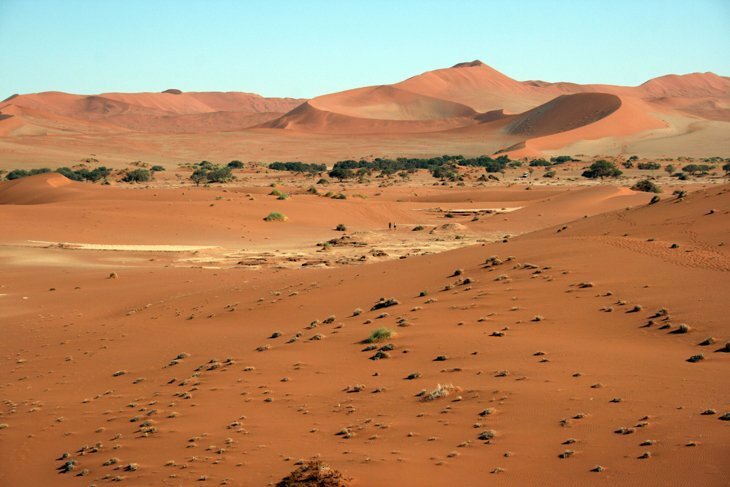 As such, Namibia is a great place for watching wildlife as well as exploring its wilderness areas…. and I’ll share some animal pictures in another post soon. 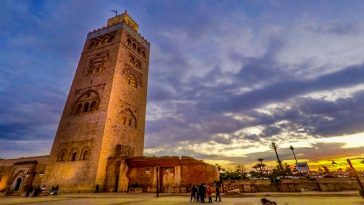 Editors note: Africa as a whole brings trips never to be forgotten. Already in this site are mountain climbs in The Atlas of Morocco and Kilimanjaro of Tanzania. The culture and wildlife of Madagascar and the colours of Kenya. Pretty soon baldhiker will have his flights to South Africa and hopefully soon enough to many other wonderful countries of this magnificent continent. Duncan Mills is a journalist and editor with a passion for travel and photography, good food and the great outdoors. 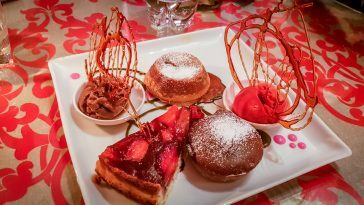 He’s visited more than sixty countries on six continents and was the deputy editor of Traveller magazine prior to joining the AB internal communications agency in 2013. He lives amid the scenic woodlands and rolling green hills of England’s South Downs National Park. 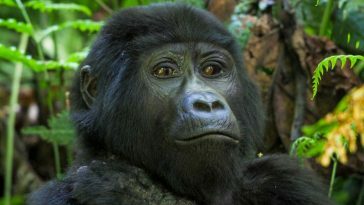 I thought a zoologist was a person who travelled to remote areas in places like Namibia, studied the landscape, people, culture, animals, and photographed, sketched, and wrote about her findings to share with the rest of the people in the world – like me – who would never have the great pleasure of travelling there. I grew up surrounded by decades of saved National Geographics and Mutual of Omaha on television. Disability has kept me closer to home than I hoped. However, the joy of research of desire for discovery is something in a person’s heart, in his or her heart, and a single city, a community, a neighbourhood, can keep us busy and happy for a very long time. With access to the internet I have access to the World Community. With access to the World Community I will be busy and happy for a lifetime. 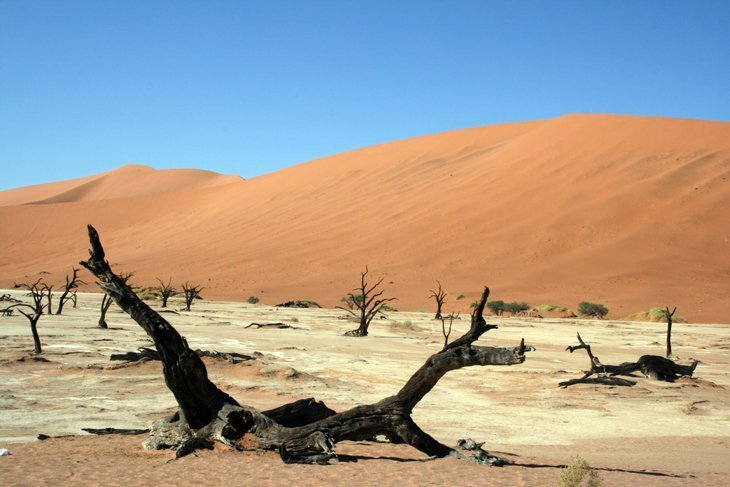 Thank you for sharing your walk in Namibia. I remember dreaming about travelling there…so, so, so many years ago. I’m 44 yrs old now and oh my goodness did you take me back to that little girl who had such big dreams! Stunning photos! The second one reminds me of the Grand Canyon, or something you’d see in the American Southwest. Absolutely impressive takes…nicely framed too. Just delighted !! !